G. Johanson, Letterpress: Letterpress Printing & Design: Removal and Maintenance of the C&P "Split Disk"
Removal and Maintenance of the C&P "Split Disk"
1. This is the disk before disassembly. 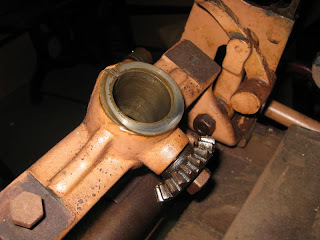 There is a nut on the bottom, which loosens the conventional direction. You will need to brace the disk. It would have been handy for the nut to turn against the ratchet direction, which would lock the disk for this operations, but - oh well. This was probably the hardest part of the whole operation. I used an adjustable spanner (wrench) and turned slowly. If you have a tight fit with the spanner, a few taps with a mallet, easy does it, may help, along with some WD-40. 2. 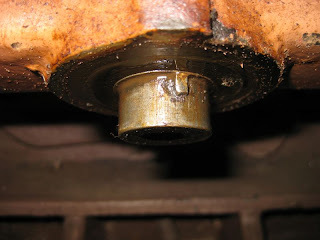 Once the nut (and washer) is removed, your gear may well be just as stuck. Quite probably past oilings only infrequently reached this area. This particular gear held fast. But the disk spun free. I noted one tooth missing on this gear. My solution: a gentle prying using a table leg which was laying around. It fit just right. I levered up and down every ten degrees of turn. Go very gently, you really need only solid localised pressure. I would advise against the temptation to hammer the gear off. Reason? 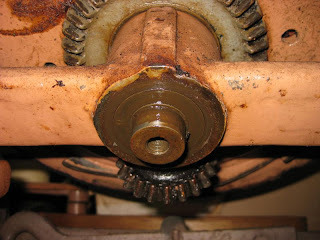 This gear is connected to the inner shaft of the disk, and is keyed. The key is very shallow. And cast iron teeth can break under sudden concussion. 3. Ok, after about five or six minutes of slightly prying every ten degrees of disk rotation, she came off. Once the gear was halfway off, I could remove it by hand. 4. Here is what the base looks like with the gear removed. The flash makes things look rustier than the press really is. Although there was rust which I later discovered. The rust shows up bright (almost) golden. Note that there is oil, but it was congealed into an almost grease-like substance. The viscosity was enough to grip the gear. Just a reminder to me of why we oil our presses, not grease them. 5. By now things should look familiar to C&P folks. This is, of course, the casting for the ink disk. 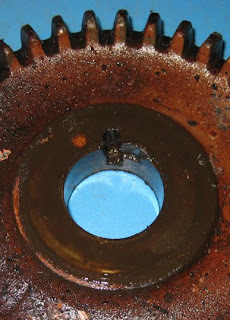 Note that the anti-rotation gear is still screwed into the casting. 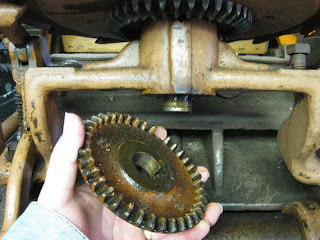 The rotation of the disk as moved by the dog and ratchet turns this gear, which in turn engages the gear we just removed. 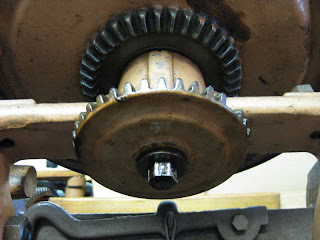 This gear is bolted and keyed to the inner disk's shaft, thus it turns the opposite direction. The effectiveness of this arrangement is a subject of debate to this day. 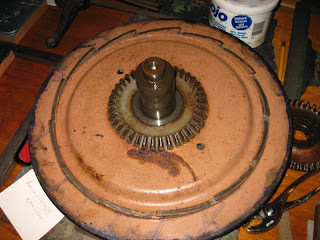 I note that none of our 12x18 models use the split disk arrangement, although the castings are there for the gearing. 6. This is the disk, with the inner disk still in place. Note the concentric shafts. We're talking some precision machining here! 7. The disks are separated. The safest way to do this and not break a couple toes is to lay the disk face down and lift. If the inner disk is lodged, a light tapping should dislodge it, unless otherwise fused purposely. 8. Here's the flip-side of the outer disk. Ahh, yes. Moisture has found the lowest point, I'd say! 9. 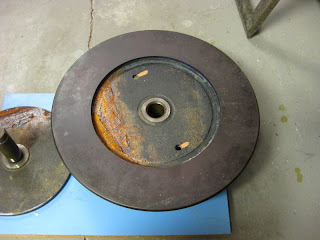 After cleaning and lubing, the disks are re-inserted, and fitted back into their casting on the press. Here is a close up of the inner disk's keying. Note how shallow it is. The lower gear has a notch to receive this key, which is why I remarked earlier to go easy on this gear in efforts to encourage movement. You could easily shear the key. 10. 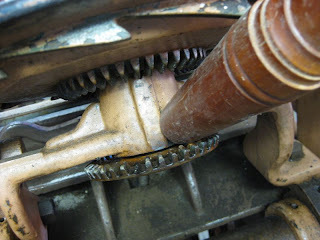 This is a close-up of the lower gear. Notice the notch. The gear isn't as rusted as it looks. Again, it's lighting and macro-focus creating a lot of the reddish colouration. And . . . the press is Vermillion coloured. I believe it to be painted from the Manufacturer. I hope this helps those of you who encounter Chandler and Price's anti-rotating concentric ink disks. One final note: a single, solid disk made for the same size press will fit nicely. Leave the rear rotation gear in the back. Or remove it, it won't really make a difference. We run both. Another comment: the oiling point for the ink disk is essentially a cleavage cut into the top of the disk mount casting where the nap (neck) of the disk's bottom rests. This is not only an awkward angle to oil from but difficult to get a quantity of oil into as well. I suggest that if you use this arrangement, that you disassemble it frequently and lube it directly. 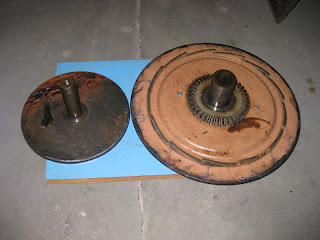 For solid disks, just lift it out and smear the oil with your finger around the inside casting and the disk shaft itself. 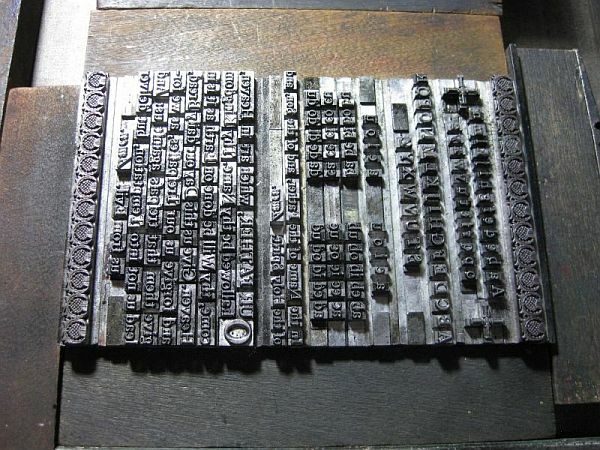 Good Providence in all your Letterpress endeavours! Video Notes: The Rear Linkage of the OS Model 3 in Motion. Angela Welch / Pen and Pauper / Custom Calligraphy! What, Oh What can a Kelsey Do? Gorgeous Florida Wedding Venue: Harmony Gardens! The Intaglio Touch: Intaglio Printing with a Bench Vise! All Things Wireless & Letterpress!